The rotator cuff is a group of four muscles that form tendons and attach to the ball of the humerus. These four muscles/tendons are: The supraspinatus, the infrapspinatus, the subscapularis, and the teres minor. The supraspinatus attaches to the top of the ball of the humerus and is responsible for raising the arm outward. 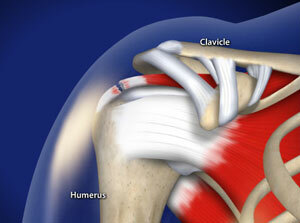 The supraspinatus tendon is the most commonly torn tendon, and is shown torn in this animation. The subscapularis tendon attaches in the front of the ball of the humerus and rotates the arm inward. The infraspinatus and the teres minor attach to the back of the ball of the humerus and rotate the arm outwards. Together, the four tendons of the rotator cuff act to keep the ball of the humerus in the socket and raise and rotate the arm. Any of the tendons of the rotator cuff can be damaged by traumatic injury, repetitive overuse, or the wear and tear of life. The incidence of rotator cuff tears increases with advancing age. In patients over the age of 60, often there is no history of injury. In patients younger than 40, there is often a history of significant trauma. Common symptoms include: pain at night, pain with overhead activity, or pain when reaching behind the back. Other symptoms of rotator cuff tear may include weakness with reaching or lifting. Rotator Cuff Tears can increase in size with time. Rotator Cuff Tears may range from small and partial in an elite throwing athlete to massive and irreparable in an elderly patient. Some partial rotator cuff tears can be treated with rest, activity modification, gentle motion exercises, physical therapy, anti-inflammatory medication and corticosteroid injections. If symptoms are not relieved by these measures, or for those who have a full-thickness rotator cuff tear, surgical treatment may be recommended.